The newly launched container ship Hong Kong of the Orient Overseas (International) Limited Shipping Company, is now claiming to be the world’s largest commercial carrier at 1,311 feet in length. Launched on December 31, 2016 at the Samsung Heavy Industries, Geoje shipyard in South Korea, this massive machine was delivered for service in May, 2017 for service on the company’s Asia-Europe trade line under the flag of Hong Kong. It has the capacity of carrying up to 21,413 twenty-foot equivalent units, (TEUs) or what we perceive as the freight boxes that fit on the rear of highway trucks. When loaded the freight boxes are stacked both in the cargo holds and on the upper deck, this loaded container ship Is literally a monster at sea, with its wheelhouse barely visible jutting up over the cargo. It is one of over 170 massive container ships now carrying cargo in the world seas. Samsung Heavy Industries opened its Geoje shipbuilding plant following a merger between Samsung Shipbuilding and Daesung Heavy Industries in 1983. This facility, one of three massive shipbuilding companies now operating in South Korea, is specializing in building large container ships, large cruise liners and heavy commercial seagoing vessels for industrial service. The company is currently in the process of building Utopia, which at just short of 1,000 feet may become the largest cruise liner to be launched by an Asian shipping company. The Hong Kong is powered by a new MAN B&W two-stroke engine, a massive two-stroke 103,000 horsepower diesel and turbo engine especially designed by Doorsan Engine of Korea for use in these massive ships. 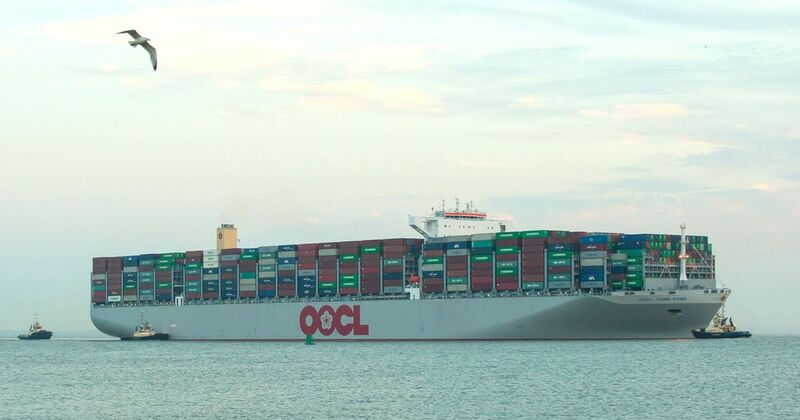 OOCL Hong Kong is already at sea following a route to North Europe from Shanghai, Ningbo, Xiamen, Yantian and Singapore via the Suez Canal, then to Felixstowe, Rotterdam, Gdansk, Wilhelmshaven, Felixstowe, back through the Suez Canal to Singapore, Yantian and Shanghai. All in all it is a 77-day trip.